The Historic Areas of Istanbul hold unique monuments from the Byzantine and Ottoman civilizations. Istanbul's history is a very long one: already in 395 (then named Constantinopel) the city was made capital of the Eastern Roman Empire. 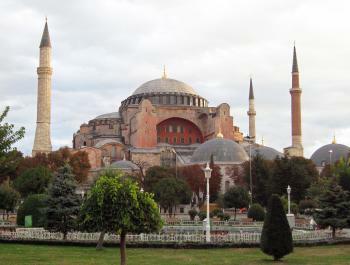 The Hagia Sophia dates from this Christian era: it was constructed by Emperor Justinianus. 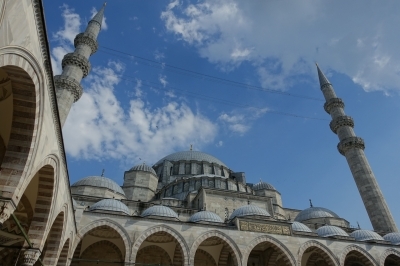 The Blue Mosque is located just across the street from the Hagia Sophia. It was built during the 17th century. On the outside its main characteristics are the 6 minarets. Inside it is decorated with blue tiles and numerous carpets. Between the 5 new WHS in north-eastern Bulgaria and the next one in Bursa (Asiatic Turkey), I had planned a full day to spend in Istanbul. I had been in this city once before: that was already in 1992 during my aptly named All Turkey Tour. So I gave myself a leisurely program this time, including only a few sights not too far from my hotel. I skipped the biggest crowd magnets such as the Hagia Sophia and the Topkapi Palace and I also entered places selectively. My first stop was the Sirkeci train station. This used to be the final destination of the Orient Express, the train that travelled from London to Istanbul in some form between 1883 and 1977. The old station has been preserved as a monument, next to it lies a new station that is in full use. The abandoned station is now ‘owned’ by stray dogs and cats. I found one cat even entrenched on the dashboard of an old locomotive and another one sleeping on a table in the railway museum. Nevertheless, the building is well maintained and the stained-glass windows in the waiting areas are still beautiful. Walking towards the most historic part of the city of Istanbul, you encounter a historic building every 100 meters or so. Each of these are explained by a handy column with information in 3 languages. One example is Paşakapısı, the gate of the Pasha. This beautiful entrance from 1799 led to the palace of the Ottoman Grand Vizier, who welcomed his foreign visitors there. A little further on I found myself at what was the Hippodrome in Roman times. Now this is a large square, with the Hagia Sophia and the Blue Mosque located on either side - making it the most touristic place in the city. For the sake of security, Turkish authorities have positioned an army tank there and the square is also screened off with fences. The former racecourse is known for its three narrow, high pillars or obelisks: one made by the Romans, one taken from Egypt and one bronze monument (the Serpentine Column) that has been here since Roman times. Afterwards I walked to the northwest for about 20 minutes, to yet another monumental mosque: the 16th century Süleymaniye mosque. This is perhaps the most beautiful among the hundreds of Istanbul mosques. You can sit down in the large garden, with both good views over the city and at the building itself. Here I did enter, the access is free. They were busy with preparations for the prayer that was to start in 45 minutes: 2 men were vacuuming the whole carpet. Unfortunately, as a visitor you have to stay at the edge of the main area and not everything is well visible because of the many wires that keep a huge chandelier in the air. After a simple but tasty lunch at the Bazaar, my first goal of the afternoon was the Rustem Pasha mosque. This work of Sinan is decorated with beautiful glazed tiles. It is wedged in by the Bazaar and I had a hard time finding the entrance. However, it turned out that it is closed for restoration. When you look at it from a distance, you can understand why. I finally ended up near the Galata bridge, which spans the Golden Horn and forms the connection between the European and Asian part of Istanbul. At the other end of the bridge lies the characteristic Galata tower, built in the 14th century by the Republic of Genoa. The bridge is also easy for pedestrians to cross. I walked all the way to the other side, in the meantime passing dozens of fishermen. In Galata I ended my sightseeing day at a luxurious coffee shop for a cappuccino with pastries. Erdogan must have had a master plan to spoil my trip to Istanbul as much as possible. Now I am not referring to the recent escalation of the conflict with the Kurds and in Syria or the overall political situation in Turkey, both of which had me postponing my long planned trip to Turkey for a year or two. No, I am referring to the (re)construction frenzy that has gripped most of Istanbul. While I couldn't care less about another skyscraper being built in the suburbs, it felt as if each and every key tourist site of Istanbul was hidden in scaffolds. Blue Mosque, Hagia Sophia, Hagia Irene, the Harem of the Topkapi Palace and the Chora Church, all were only partially accessible. If I were running the joint I would focus on one or two sites, finish and move to the next sites. My Turkish hairdresser back in Germany only rolled his eyes at my suggestion: Construction sites are good for your pocketbook, the more the merrier, the longer the better. The scaffolds may have been one of the reasons why Istanbul didn't come together for me. Another was the traffic which makes it hard to just wander around in Istanbul as a pedestrian. Last but not least, I was left wondering how much had been lost when the city first fell to the 4th Crusade in the 13th century and finally to the Ottomans in the 15th century. This is best exemplified by the Hagia Sophia. Having seen the murals in Ravenna which are from the same period I did assume to find something similar, only on a grander scale. But when I entered the building that once was the greatest church of Christendom, only little of the Byzantine glory of Late Antiquity and the Middle Ages remained. In the upper floor you will find a few murals, but the greater part of the building had to make way for Muslim iconography and calligraphy. I felt reminded of Cordoba where the reverse happened and a monstrous church was built in what must have been one of the greatest mosques of its time. To get a glimpse of Byzantine glory the Chora Church is the better visit. Strolling around cities, ditching buses and trains for lengthy walks, is the way I tend to enjoy cities the most. Unfortunately, in Istanbul this was only possible in very limited areas. Istanbul primarily features tiny sidewalks in a sorry state (look out for potholes!) that are commonly used as parking lots. So you end up walking on the road with plenty of cars running by; not a way to relax and stumble into nice places. In addition, as pedestrian you end up having to take plenty of detours to cross major roads as there tend to be only a few crossings. And those crossings that exist also make you wait as the traffic lights are optimized for car throughput, not pedestrian wait times. Istanbul offers a reasonably good public transport network with metro lines, trams and plenty of buses. The problem is, though, that the network is a bit cumbersome, at least for tourist destinations. The metro line connecting you to the airport ends in Yenikapi just shy of the old town, so you have to walk another 30min. Or you transfer. If you plan to get to Besiktas the tram ends half way, so you have to transfer to a bus. This would be okay if transfers were less of a pain than they are. If you transfer from Metro to Tram near the Grand Bazaar, as recommended by the transport authorities, you first have to exit the station, traverse the road via underpass, then pass a park, follow the road a bit, ... In total it takes you 10min to transfer. I would have been lost had it no been for google maps. Also note that you pay the fare twice when you connect. I would recommend getting an Istanbul Kart (start with 20 TL and take it from there). These are available at most tram and subway stations and can also be used for the ubiquitous public restrooms. If you plan to visit the main sites (Topkapi Palace, Hagia Sophia) it's worthwhile to get a museum pass. The break even is reached when you visit the Hagia Sophia, Hagia Irene and the Topkapi Palace plus Harem. For good measure I would also visit the archaeological museum where you can see some of the counterparts to exhibits in Berlin (Ischia Gate, Pergamon Altar) and London (Akropolis). Finally, it also provides access to the Chora Church, a must visit to me. The museum card will let you skip the queue. To optimize the time savings do not buy it at Topkapi/Hagia Sophia as the lines are long. Instead, start off at one of the minor sights (Hagia Irene would be my recommendation) where the queues are shorter. As soon as you have the pass, you can skip the long lines at Hagia Sophia and Topkapi and head directly to the ticket control. Side remark: At Hagia Sophia guides will offer to take you in and enable you to skip the queue, too. This may be worthwhile if you only plan to visit Hagia Sophia. Istanbul boasts three entries on the Turkish tentative list. These can be easily covered within a day. The Nuruosmaniye Mosque is just a short detour from the main tourist area. Not that stunning. The Galata Tower is part of the Genoese Fortifications and just across the river. It provides very nice views of the Hagia Sophia and the old Town. The area around the tower is also very nice and recommended. Finally, the Yildiz Palace Complex is a bit off in Besiktas and will probably require you to take a bus or so. Note, that at the time of writing the palace is undergoing renovations and only the mosque is accessible. 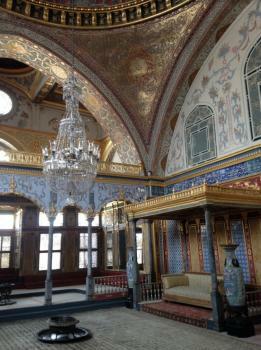 While you are in Besiktas I would also tick off the Dolmabahçe Palace. I feel the Ottoman Palaces should be combined and submitted as one serial nomination akin to Torino. Two sites that can be done in a day trip are the Selimiye Mosque in Edirne and the historic center of Bursa. Bursa is a fun trip with a nice boat trip. Edirne on a day trip meanwhile is only for the hardened traveller (at least 4h one way if Istanbul traffic allows it). I recommend staying over night. I enjoyed Ian's recommendation for Turkish sweets: ‪Osmanlizadeler‬. They are pretty close to the Topkapi palace. Having dinner on a roof top terrace would have been fun, but the weather didn't really allow for it in our case. Be sure to check if a Cafe or restaurant is halal if you want to have a beer along to dinner. Certainly this is one of Europe's most impressive cities, with an astonishing history displayed in one of the greatest built environments on the World Heritage List. Throw in a welcoming atmosphere, some excellent food and bustling nightlife it really was a rewarding four day stay for us. However things changed a fair bit after we left. Within hours of us flying home a bomb went off just outside the Grand Bazaar, a week later an explosion hit the International airport. Within a month there had been an attempted coup and subsequent clampdown on civil liberties. I wonder how much this would affect the visiting experience. The sights in Sultanhamet have been covered here extensively. Though I will say, amazingly the Topkapi Palace managed to be a distinct highlight for me, even with my renowned loathing of such complexes, the Harem really was a bit special and well worth making the time to visit. Additionally I wanted to point out the review of Tony H, who inspired perhaps the best patch of our whole trip. We headed up to the city walls for these sweeping panoramic views. From there it was on to the Chola Church and staggeringly beautiful pearl of byzantine art and certainly it should not be missed. We ventured on a walk in vain to try and catch a ferry, but unexpectedly ended up in a surprisingly hip and trendy area of Fener. Istanbul felt very human in scale and finding distinct and intriguing neighbourhoods made the city very enjoyable. Istanbul really is one of Europe’s greatest cities and the collection of impressive sites is matched by a wonderful and vibrant network of a modern massive city, populated by friendly and lively inhabitants. I hope that it manages to still display these things even after the changes that have occurred in the year or so since our visit. My highlight of the Istanbul site is definitely the juxtaposition of the Blue Mosque and the Hagia Sophia. The two buildings look across the crowded square at each other. Like Istanbul itself, they both divide and join the citizens and their history. Represented within these two great landmarks is the core of the city’s heritage. If the buildings were people, historical figures even, they would be eyeing each other off with an acceptance of contemporary diplomacy but with memories of a violent past. A wonderful WHS that captures the history of this region so perfectly! I went to Istanbul with friends in January 2014. Due to a lack of preparation we ended up only visiting 2 of the 4 inscribed components. 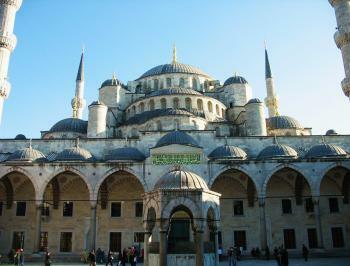 The first was the beautiful Süleymaniye Mosque. A prayer had just finished, so we went up to the entrance, took off our shoes and went inside. You don’t have to pay to get into the “working mosques”, and it is well worth doing – don’t just go to the inactive Hagia Sofia! Inside the mosque the floor is covered in a rich carpet, and the walls and ceilings are exquisitely detailed. It was a nice day outside, so after the Süleymaniye we went for a beer on a rooftop café we had spotted from the gardens. Except we didn’t get a beer. That’s one thing we learned about Istanbul – it’s very difficult to buy a beer within sight of a mosque. Which, in a city as richly endowed with them as Istanbul, is a lot of places! The other subsite we went to was the Archaeological Park's museum. We also visited the Basilica Cistern, the Galata Tower, the Hagia Sofia and the Blue Mosque. I suppose we also saw the 'Land Walls of Istanbul', but only whilst driving past, so I don't count it as 'visited' properly. Istanbul was Constantinople, now it's Istanbul not Constantinople, and I have to say the city is just about as addictive as the song. I visited Istanbul twice on a trip to Turkey in 2007, and once on a trip in 2014, and it ranks high on my list of favorite cities worldwide. The Ottoman architecture of the Süleymaniye Mosque and the Sultan Ahmed Mosque are extremely impressive, as is the Byzantine architecture of the Hagia Sophia, a former Orthodox basilica that was converted into a mosque and now serves as a museum. The history of the Ottoman empire can be explored through tours of the Topkapı Palace, while below the surface of the Sultanahmet neighborhood are impressive cisterns which I'm glad other reviewers have enjoyed as much as I did. A bus ride to the Edirnekapı neighborhood grants access to the exquisite mosaics of the Chora Church as well as a well-preserved section of the city walls. Perhaps the best way to see the city of Istanbul, though, is by water via a ferry ride across the Bosphorus strait. Istanbul is a city which I'd love to return to some day. Logistics: Istanbul has an extensive transportation system, including trams, buses, and ferries. 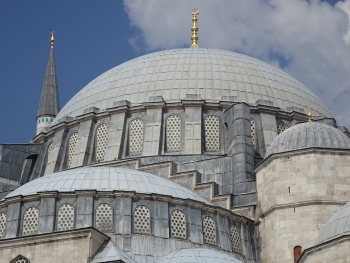 Many famous sites in the Sultanahmet neighborhood are easily accessible on foot. I feel myself lucky as I've been able to call Istanbul my home for one year. 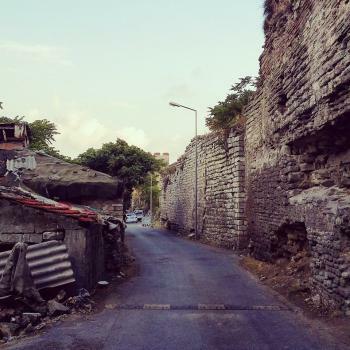 It has given me the possibility to explore the city slowly and especially it's vast historic areas on Fatih peninsula. The World Heritage site is made up of 4 different quarters. The most famous of them is the Sultanahmet area at the tip of the peninsula. From here you can find the biggest attractions: Hagia Sophia (Ayasofya), Blue Mosque (Sultanahmet Camii), Topkapi Palace (Topkapi Sarayi) and Basilica Cistern (Yerebatan Sarayi). This is the area you want to avoid visiting while you live in the city as it is overrun by tourists for most of the year and prices are higher than elsewhere in the city. After visiting the attractions (which are magnificent, there’s no denying in that) I prefered admiring this part of city from the ferries going between Asia and Europe. Interesting museum to visit in this quarter is the small Great Palace Mosaic Museum at Arasta Bazaar. In this museum you can see Byzantine pavement decorated with amazing mosaics. 2nd inscribed quarter is around Süleymaniye Mosque. Süleymaniye is the biggest mosque in Istanbul and gets also quite a lot of tourists but is much more calmer place to visit than Blue Mosque (no need to line up to get inside for example). Also I prefer myself the style and decorations of this mosque over Blue Mosque. Other bigger mosque in this quarter is Sehzade Mehmet Camii which is located next to Valens Aqueduct (Bozdogan Kemeri). The mosque is nothing special compared to the bigger ones but the aqueduct is quite magnificent especially over the main road that goes under it. The part where the aqueduct goes over the road is interestingly not part of the inscribed area. The 3rd inscribed quarter is small Zeyrek quarter which includes Byzantine Molla Zeyrek Camii. Originally 2 churches, it is now a mosque. I still need to visit this quarter which shows that there is so much to see in this city. My favorite is the 4th quarter which includes the Byzantine city walls. I highly recommend to walk the whole length of this wall. It’s probably easier to start from the southern side and end to the Golden Horn so that you don’t need to walk first uphill. Mostly it is easy to walk right next to the wall but sometimes you have to go little bit further away from it. There are lots of places where you can climb on top of the walls and have spectacular views over the whole city, the best place is probably at Edirnekapi near Chora Church. Climbing is however very risky as steps are mostly in bad condition and there no safety railings or fences so do it on your own risk! Along the walk you will see lot of poorer neighbourhoods so it’s preferable going together with someone as locals might get little too interested in you there; we once experienced gun fight in the traditional Roma neighbourhood of Sulukule. However Sulukule also has very modern new buildings which reminds me of Scandinavian suburban housing. So in this area you will experience the diversity of the city at its best. One of my favourite things on the walls are also the gardens that the locals are keeping between the wall remains. As I mentioned earlier this inscribed area also includes the small Chora Church (Kariye Müzesi). This small former Byzantine church features the best mosaics in the city and should not be missed. Besides the inscribed areas on the peninsula I would also recommend to have a walk in the colourful neighbourhoods of Fener and Balat along the Golden Horn and visiting Fatih Mosque where the tomb of Mehmed the Conqueror is situated. I visited this WHS in December 2013 before Christmas and in January 2014. The highlights of this WHS were the landmarks and unmissable Blue Mosque, Hagia Sophia and Topkapi Palace. Their interior and exterior beauty is sublime. Other noteworthy sites are the Basilica Cisterns, Chora Church (Byzantine jewel! ), Galata Tower, Byzantine City Walls, the Grand Bazaar and the Spice Bazaar. The Sultanahmet area alone is definitely worth a visit even though there are plenty of other sites to visit. An incredible city with a wide variety of things to see and do. Delicious food, interesting people, and exquisite Byzantine & Ottoman sites. Hagia Sophia is a magnificient work of architecture, the Blue Mosque is impressive, the intricate designs are easy to get lost in. The cisterns are worth a visit as well. For some the Ottoman Palace is a slight letdown, however I felt it was still worth my time, but I agree it was not my highlight. I enjoyed 5 days in Istanbul and I wish I only had more time. Kabab's everywhere, the Great Bazaar, the call to prayer. All good memories in experiencing a unique and beautiful city. There has been concerns in recent years about the preservation and management of Istanbul. When I visited the iconic walls, they were in a sad state, but the remaining monuments to my untrained eye looked quite well protected. The historic areas of Istanbul are great to visit. The Aya Sofya and the Blue Mosque are obviously the center pieces, but there is more in the area; the underground cisterns, Topkapi and Dolmabahce palaces, the Chora Church. All these are nice to go to except perhaps for Topkapi, which I felt was overpriced and over-rated (The Harem is not at all worth it!). The Bosphorous is always there, and wonderfully accents all of these places. Give Istanbul at least 3 days! The tremendous structures of the Golden Horn speak volumes as to Istanbul's illustrious past as a center of trade and empire. From the soaring minarets of the impressive Blue Mosque, to the cavernous halls of the Hagia Sofia to the beautifully tiled chambers of Topkapi Palace, the Sultanahmet region alone attest to this site's inclusion on the WHS. We walked past a line of sidewalk vendors selling bread and pastry, fishing boats offering fish for sale, and a ferryboat terminal, disgorging crowds of people. We had only a precious too few hours to visit Süleyman (Blue) Mosque, St. Sophia Mosque, and shop in the 4,000 stall Grand Bazaar. As we walked back to the ship we again crossed the bridge over the Golden Horn. It was meal time, the restaurants were filling with hungry patrons, fishermen were still selling fish, street stands were still selling pastries, the ferryboat terminal was still disgorging passengers. Those street scenes will be there for us to enjoy when we return to this city, the most enthralling of the 124 ports we have arrived at, or departed from, on a ferry or cruise ship. Designed by or influenced Le Corbusier: Visited Hagia Sophia in 1911 and later wrote about it (see link). Thought to have influenced his ideas on the importance of interior space, use of light, the cupola and of silouhettes. e.g Chandigarh? Zero Mile or Kilometer Markers: The "Milion" was a "mile marker" erected in early 4th century AD in Constantinople as the starting point for measurement of distances in the Byzantine Empire. Originally a building with arch, dome and statues it became a location for imperial ceremonies. It survived until early 16th century when the Ottomans demolished it. Fragments were rediscovered in the mid 1960s and a pillar from it stands in Hagia Sophia Square. Terrorist Attacks: On 12 January 2016 a suicide attack in Istanbul's historic Sultanahmet Square district killed 11 people, all foreigners. Ottoman Empire: Capital of the Ottoman Empire. Thomas Cook Round the World tour 1872-1873: April 1873 "Round the world I have found no place so wretchedly provided with hotels as Constantinople and I shall be glad when, on the Sea of Marmara, "homeward bound" we turn our backs on the Golden Horn"
Diplomatic Missions of Joseon Envoy Min Yonghwan: 13 May 1897 (Lunar date: 12/4) Bright and cold like yesterday. "At 6:00 A.M. we passed the old capital of Turkey, Constantinople. It is situated along the western shore. Continuously for several hundred leagues there is luxuriant, bright countryside. The fields are like inlay or embroidery. Moreover, we passed two royal palaces. These were many-storied buildings that rose up halfway to the sky with whitewashed brick battlements. They were exceedingly marvelous. There were gun batteries on both shores, scattered like stars or chess pieces. It is rightly called a great wonder." Locations for playing sport: Roman hippodrome. Its remains are close to the Blue Mosque. Historical Graffiti: Runic inscriptions in Hagia Sophia, made by members of the Varangian Guard in Constantinople in the Viking Age. Emperor Justininian: Hagia Sophia was the third Christian church on the site - the 2nd was burnt down in the Nika Revolt on 13/14 Jan 532. 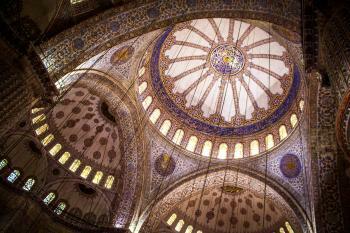 The new construction was ordered within days by Justinian himself and took only 5 years to build. He was present at the consecration and, according to legend, commented "Solomon, I have surpassed thee". Helen of Constantinople: "Her body was brought to Constantinople and laid to rest in the imperial vault of the church of the Apostles." Rabban Bar Sauma: 1287: he had an audience with Andronicus II Palaeologus. Bar Sauma's writings give a particularly enthusiastic description of the beautiful Hagia Sophia. Naser ed-Din Shah: ""We arrived at the beginning of the habitations of the city of Islambul. On the left hand is the land of Europe ; on the right, the land of Asia.. We breakfasted at home ; after which we went to the city of Islambul to pay visits to the mosque of Saint Sophia and the residence of the Persian mission." Former Largest Cities: From 350-550 A.D. Gypsies: The Sulukule district (within the inscribed area was the traditional area for Roma/Romani etc. Istanbul has just been criticized for not protecting it. 545 Community Members have visited.